Dismal Japanese data ends benefiting the yen in a risk-averse environment. Equities losing momentum after mixed earnings reports, yields holding at highs. The USD/JPY pair continues trading just below the 112.00 mark, with major pairs still confined to tight intraday ranges. The pair extended its weekly decline by a few pips, bottoming at 111.84, as the greenback remained pressured and risk-related sentiment continued deteriorating, following Wall Street's negative close, and comments from US President Trump, once again taking it against Fed's monetary policy of higher interest rates. Japanese data released at the beginning of the day disappointed, as the March Tertiary Industry Index declined by 0.6% in March, worse than the -0.2% expected. The negative reading exacerbated risk-off sentiment. Meanwhile, US Treasury yields continue hovering near the multi-week highs set late last week, limiting USD/JPY declines. The American currency advances against other rivals included safe-haven gold, yet seems poised to extend its decline against the yen. The US macroeconomic calendar will remain scarce, offering today March´s Capacity Utilization and Industrial Production, seen barely up when compared to February. 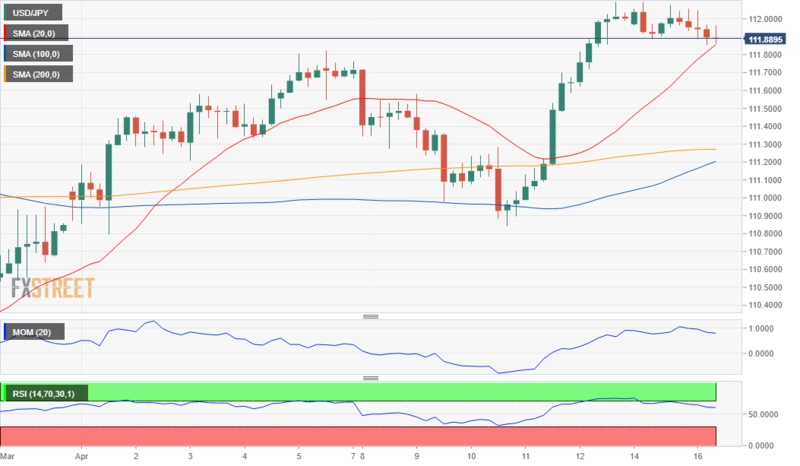 The pair trades near the mentioned low, nearing a sharply bullish 20 SMA in the 4 hours chart around 111.80, providing an immediate short-term support. Technical indicators in the mentioned chart ease from overbought levels, the Momentum now trying to stabilize just above its 100 line, while the RSI maintains its downward slope, now at around 58. The case for a downward extension will be clearer once below 111.80 and firmer, should the pair extend its decline below 111.50. The upside remains capped by selling interest at around 112.13, the yearly high, with the tide changing only on a clear break above the level.